We are witnessing the largest opening to build the socialist movement in the U.S. in decades and it is not just leftists who recognize it. National Review, a leading right-wing journal, published a breathless warning in March titled “Socialism’s Rising Popularity Threatens America’s Future” by David Nammo, CEO of the Christian Legal Society. This rising support for socialism is driven by a growing disillusionment with capitalism. Of course, what is understood by the term “socialism” is still quite vague and limited but it is not meaningless. Support for government intervention in the form of universal social programs like Medicare for All and free college, paid for by taxing the rich, has grown – especially among young people. It is against this background that we have seen a significant growth of organized socialist forces, especially the Democratic Socialists of America (DSA). As part of the outpouring of protest against Trump, DSA has grown from around 8,500 on Election Day to about 21,000 as of early May. It is the largest socialist formation in the U.S. since the 1960s, and it is well positioned to grow further. 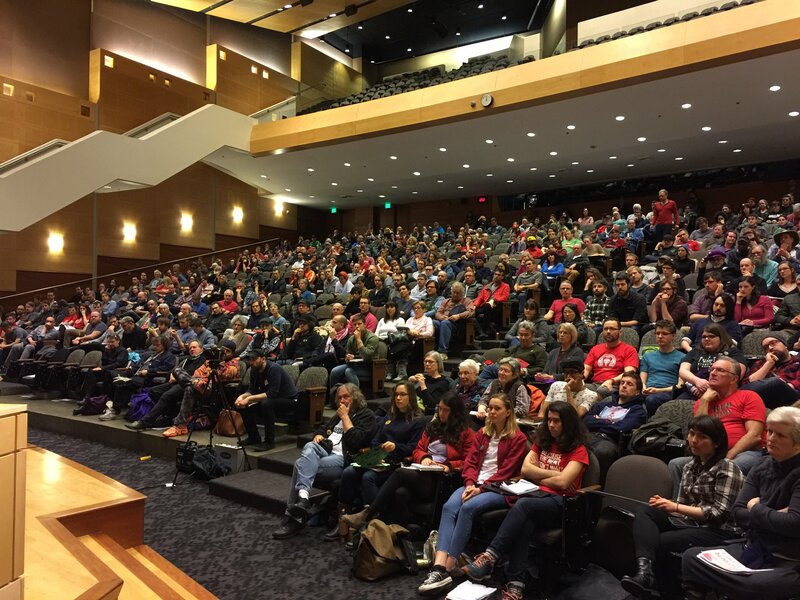 Socialist Alternative welcomes that thousands of people are building a broad socialist organization. We are excited to work together with DSA members and all others interested in socialist ideas to build the socialist and anti-Trump movements in a non-sectarian fashion while honestly discussing political differences. Historically, DSA was an anti-communist, social-democratic trend that was committed to a long-term strategy of transforming the Democratic Party. Following the Occupy Wall Street movement in 2011, DSA began to change from an organization in decline when a layer of younger, more radical elements around the newly-launched journal Jacobin joined. In 2015, DSA threw itself energetically into the Sanders campaign, laying the basis for its explosive growth following Trump’s victory. In this new situation, the DSA became a rallying point for many left-wing Sandernistas who were outraged by the failure of Clinton to defeat Trump. Its socialist profile and being seen as inclusive organization strengthened its attraction to these elements looking to remain active. DSA is an evolving organization. Within it are a wide range of views on a variety of issues. There remains an important section of DSA that still maintains its traditional politics. But it appears that this wing is now a minority and that the new people joining are largely supportive of the more left-wing current around Jacobin. DSA’s convention in August will help clarify its politics in this new situation. Among the new people joining DSA, the majority despises the Democratic Party establishment and is enthusiastic about building a broad-based socialist movement. Some share the position of Socialist Alternative that we should work outside the Democratic Party as part of a strategy of building a mass, membership based left-wing party. But the DSA majority sentiment is more “pragmatic,” seeing the question of participation within the Democrats as a tactical issue. This coincides with the dominant mood on the left for a “Tea Party of the left” strategy. The growth of DSA will pose real questions and challenges for how it should use its new influence to advance the struggle. Events will require a fuller discussion and debate about what ideas and program are necessary to successfully build a new socialist movement on a solid, principled basis that can avoid repeating the failures of previous mass left formations. Is their vision of socialism a social-democratic model where capitalism remains intact but with a strong welfare state? Marxists fight for every reform we can squeeze out of the ruling class, but we recognize that these reforms are fundamentally incompatible with capitalism in the long run as shown by the huge neoliberal attacks taking place in Europe. We link the fight for reforms to the need for a fundamental transformation of society which breaks the power of capital and establishes a new social order based on mass, democratic institutions of workers and the oppressed. More immediately, as a larger force, what will DSA actually do? What will its policy be in the debates that break out in the anti-Trump movement? Will DSA run its own candidates independently of the Democratic Party or within the Democratic primaries? How will DSA hold them accountable when they get elected or when they get elected to leadership positions in social movements? Does the DSA have a way to combat the huge pressures towards opportunism and careerism that such positions inevitably create? New left forces can fall into crisis, sometimes quite rapidly, if they fail to get these questions right by measuring up to the needs of the situation, as has been shown with the Chavistas in Venezuela or Respect in England and Wales. The history of the past 100 years of the international workers’ movement has shown the power of an organized movement to win huge reforms. However, it also graphically demonstrated the bankruptcy of the ideas and strategy of reformism: the historically dominant political approach on the left of trying to fit the needs of workers and the oppressed within the framework of capitalism, or arguing that a socialist society can be gradually established using the existing “democratic” mechanisms of capitalist society. In this existing class society you can’t please both the billionaires and working people. Those who try to appease the capitalists and workers tend to end up trying to limit workers’ aspirations and demobilize their movements. The example of SYRIZA in Greece is only the most glaring illustration of the complete inability of reformism to meet the needs of the working class in this era of capitalist decay. That is why, in our view, a cohesive Marxist organization is needed that can systematically argue for revolutionary socialist policies within the wider movement. Socialist Alternative is working to build such a Marxist force while collaborating with all genuine elements to also build a broader left. Despite the huge threat of Trump’s attacks, the enormous movement of resistance has opened a new period of mass politicization with huge opportunities for the left. Socialist Alternative urges DSA to take advantage of its rapid growth and dynamism to use this potential to launch a new, broad, democratic Socialist Party. In our view, there is an opening to bring together the best forces on the left, and, more importantly, a new generation that is actively looking to fight for socialism. With a bold lead from DSA, a new party of 50,000 to 100,000 members could be rapidly built. Of course, without further steps toward political clarification of key strategic issues such a formation would have an unstable character. Nevertheless, this would represent a qualitative step forward for the socialist movement. A new party should have a broad, federal-type character, allowing organizations coming from different backgrounds to affiliate with full democratic rights. Socialist Alternative will bring our political ideas to the discussions in such a formation. It would allow different trends to join forces while collectively discussing and testing out the best way to build a fighting, socialist pole within the broader movement. A new Socialist Party would need to be a party of struggle. Our key power in this society comes from organized collective action. A new party should also boldly run candidates independent of corporate cash and independent of the corporate-controlled Democratic Party. Such a force could act as a forerunner for a much larger mass party when wider layers of the working class come to the conclusion that the Democratic Party is fundamentally a big-business party and move to build their own political party. The rapid growth of DSA is an exciting sign of the radicalization taking place in U.S. society. A sense of urgency is needed to fully seize this opportunity. Combined with a determined struggle to achieve the necessary political understanding, program, and strategy, we can rebuild a powerful socialist force as a key part of the developing resistance to Trump and the billionaire class. Previous articleDefeat Trumpcare Once and For All!